Remember how every single French woman I have ever met has confessed to an obsessive fascination for face masks? They are simply following in the heritage of the likes of Marie Antoinette and Catherine de Médicis, who were slathering potent stuff on their faces long before beauty brands took over the running of our lives with pre-packaged goodies. And things haven’t changed much in France since then. Even in a busy, urban city like Paris, women regularly turn to time-tested skincare recipes that have been passed down from one generation to the other since the late 1500s. These are the recipes that have also inspired today’s cult-French brands like Caudalie and Nuxe. So, why not go straight to the source and replace the lab-manufactured with the sunny-farm-grown? After all, there is no better (and easier) way to glowing skin than a treatment that comes straight from your own refrigerator, right? Parisians are fairly obsessive about facial masks made from cabbage (yes, cabbage!) as this leafy veggie is chockfull of sulphur and potassium, along with vitamins A, C and E, which make it wonderful at deep cleansing, evening out and nourishing the skin. 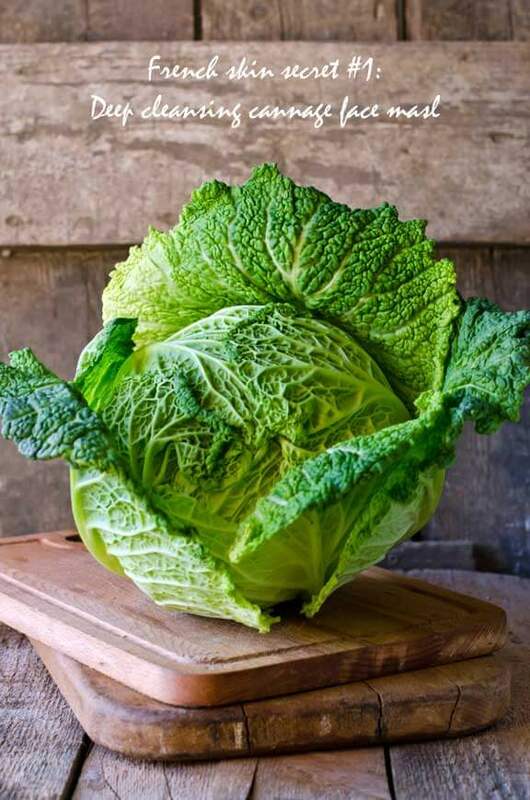 Deep cleansing cabbage face mask (oily skin): Grind a quarter head of cabbage and mix it into a beaten egg white. Apply this paste on your skin, then wash off with warm water after 20 minutes. Deep cleansing cabbage face mask (dry skin): Chop up some cabbage leaves and boil them in milk till you get a porridge-like consistency. Strain the liquid and layer it on to your face and neck. Let it sit for 20 minutes, then wash off with warm water. Nourishing cabbage face mask (sensitive skin): Mix the cabbage gruel (as above) with the yolk of one egg and a tablespoon of olive oil. Apply this on your face and neck for 20 minutes and then wash off with warm water. There is a reason everyone from Caudalie to Body Shop is bringing in the grapes for their skincare products. The juicy fruits are brimming with AHAs, which pitch a three-pronged battle against premature ageing: they exfoliate your skin, helping to shed old cells that make it look dull; they stimulate the production of collagen and elastin, fibres that prevent wrinkles and sagging; and they hydrate the complexion. Smoothing and brightening grape face mask (all skin types): Mash 8-10 grapes (red or black varietals are more potent than green), add a teaspoon of olive oil, two tablespoons of gram flour and mix everything well. Apply this paste to freshly cleansed skin, then wash off with warm water after 15 minutes. French beauty recipe: Peachy keen! 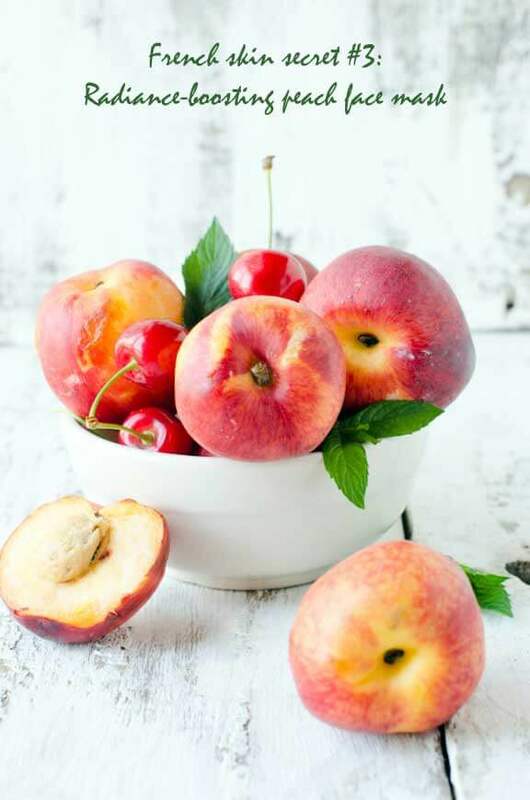 Peaches are brimming over with vitamins, minerals and antioxidants that help regenerate skin tissue, reduce blemishes, stave off wrinkles, tighten pores, ward off skin infections and protect against UV rays. Radiance-boosting peach face mask (suitable for all skin types): Scoop out the pulp of a ripe peach and mash it up with a spoon. Apply this to freshly cleansed face and neck, leave on for 20 minutes and then rinse with warm water. Avocados contain high levels of antioxidant carotenoids like alpha carotene and beta carotene, which protect the skin against environmental damage. They are also potent sources of topical vitamins C and E, along with a host of moisturising fatty acids (such as oleic acid) that maintain moisture in the epidermal layer (top layer) of your skin, helping to keep it soft and hydrated. Oleic acid also helps regenerate damaged skin cells and calms down an irritated complexion. UV-protection avocado face mask (oily skin): If your skin is dry, apply a mixture of a tablespoon of honey mixed with fresh thyme and the meat of half an avocado. UV-protection avocado face mask (dry skin): Crush the pulp of a ripe avocado, mix it with an egg yolk, and put it on your face. Wash off after 20 minutes. French beauty recipe: An apple a day… ! Besides their zillion other beauty benefits, apples balance the skin’s pH levels, gets rid of surface bacteria and regulate sebum (natural oil) production. The result? Healthy, glowing skin sans signs of stress, fatigue, acne or greasiness. Anti-acne apple face mask (all skin types): Pour boiling water on a slice of apple and let it soak for 5 minutes. Then remove the apple slice and let it cool slightly. Lay the slice on the pimple and let it remain for as long as possible (at least 20 minutes). Do this twice a day if you have an under-the-skin pimple that refuses to budge. Berry-based face masks firm and brighten the skin, thanks to the fruit’s natural enzymes. 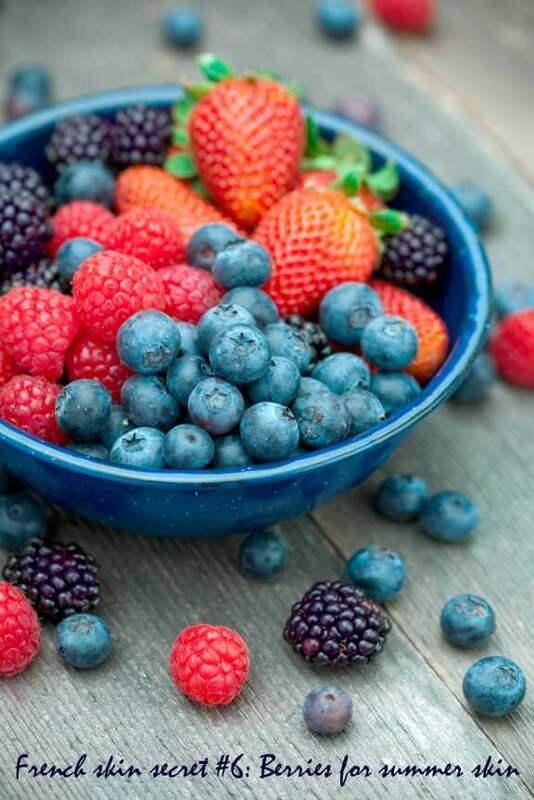 Additional benefit: berries cool down the skin tissue during long, hot summers. Complexion reviving berry mask (oily skin): Crush 15-20 fresh berries and add 2 tablespoons of natural yogurt. Mix well, then pour in 3 drops of sweet orange essential oil; stir well. Apply the paste to clean skin, avoiding the contours of eyes and mouth. Leave for 15 minutes, then rinse off with plain water. Complexion reviving berry mask (dry skin): Apply a mask made from crushed strawberries mixed with just enough honey to form a thick paste. Or mix equal quantities of crushed cherries and pomegranate seeds. Apply the paste to clean skin, then wash off after 15 minutes. Bananas are an excellent source of beauty-boosting vitamins A, B, C and E and minerals such as iron, zinc and potassium. They are also rich in amino acids and antioxidants, which are invaluable for skin health. Soothing banana face mask (dry and sensitive skin): Crush the pulp of a banana with a fork; apply to the face and the neck. Leave it on for 15 minutes, then cleanse with warm water. This mask has invigorating and smoothing effects. Bananas face mask for blackheads (all skin types): If you have blackheads on your nose, use the skin of a banana. Rub it on your nose and it will make the blackheads pop out more easily. Have you tried any of these beauty recipes? What’s the signature skincare treatment of YOUR country? Do share. « I am back… and have a lot of goodies for you, all the way from Paris, Rome, Geneva and Stockholm! This was a wonderful information on this page about the skin care tips in summer season with the outstanding steps to eliminate the dryness from the Sensitive skin of body in a seven days by using the hemp seed oil with the best moisturizer cream daily according to the required period of a time after the recommendations of a doctor and also follow the instructions of a doctor which help you to remove this kind of skin dryness disease with the use of best skin moisturizer cream ,My suggestion is you must go to a doctor one time in a week for starting of proper treatment of eliminating dryness with skin moisturizer cream appeared on the Sensitive skin of body in a summer season due to the effect of sun rays,keep it in your mind don’t work in the light of sun because the heat of sun with the dust particles in sun rays increase the rough dryness and cracks with lines on the skin due to the demaged of upper skin layers cells after the working of some time you notice the color of skin become black and cracks with lines are increased on the Sensitive skin of a body this is also a effect of skin cancer . So take care of skin and avoid to work in a light of sun . you also use hibiscus face mask on the face if necessary to work in the light of sun and also use carrot in the food salad .